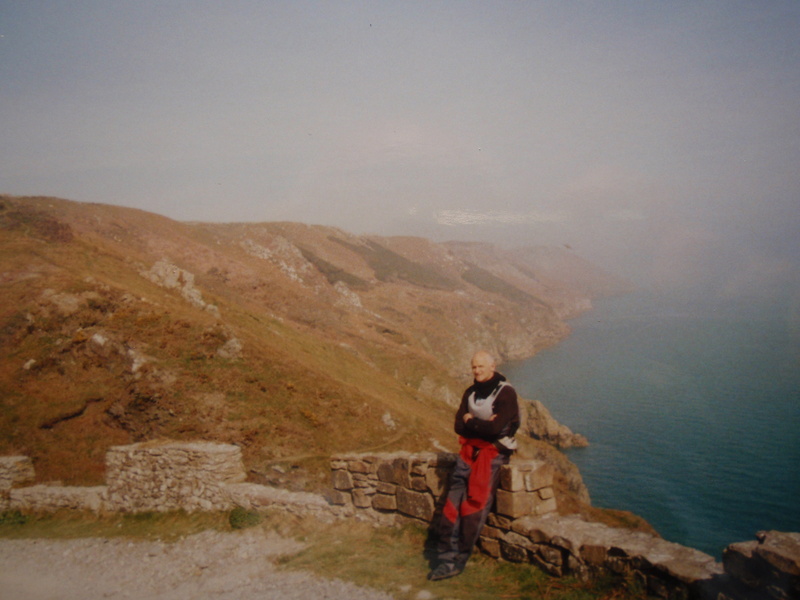 Austen and I had muttered about a trip to Lundy early in 2007 but hadn’t expected the unusual conditions of no swell and light winds to turn up so soon. I drove through thick fog on the way to Hartland quay on Good Friday but my scoolboy knowledge of weather gave me hope that you don’t get that type of fair weather fog over the sea. Sure enough the stars were shining brightly as we set off at the first whimper of daylight, but it was just a little concerning that we couldn’t see the lighthouse on Lundy flashing. My sunglasses were on their way to Davey Jones’ locker within a minute of departure, but we were soon shooting up the coast on the incoming tide past Hartland Point and then swinging out offshore on Austen’s pre-planned GPS course. He did the technical stuff, I made the sandwiches. We were bowling along at a good speed on flat calm sea and I was pretty pleased in the ornithological department- guillemots,razorbills,a few manx shearwaters and,for the exceptionally nerdy observer,a Little gull. Seven miles offshore we stopped for our half way tea break (and other break which I won’t go into,but wasn’t easy). As soon as we started to paddle again things got interesting…..very interesting. We were suddenly enveloped in a pea-soup fog with visibility less than 100 yards. We think it was the radiation fog spilling off the land out of Bideford Bay. If Austen hadn’t had his GPS and been on a yachty training course I suspect our next land fall would have been somewhere along the east coast of Greenland. We ploughed on in the silence but suddenly my heart did a funny squelchy thing when a ship’s foghorn boomed out so loud and close it made my fillings rattle. Then it boomed again and we could hear the thudding of its engine just like in a scene from ‘Das Boot’ ( Get back to zer engine room, Johann). I couldn’t believe our bad luck-ships around here are scarce. Next time it boomed it,phew,had passed and we never even saw it. I trusted Austen’s navigation implicitly but when he announced we had only 318 ft to go and all we could see was swirling murk I thought mmmmmm. But suddenly, wallop, cliffs materialised. Not bad-hope my sandwiches turned out to be as much of a success. 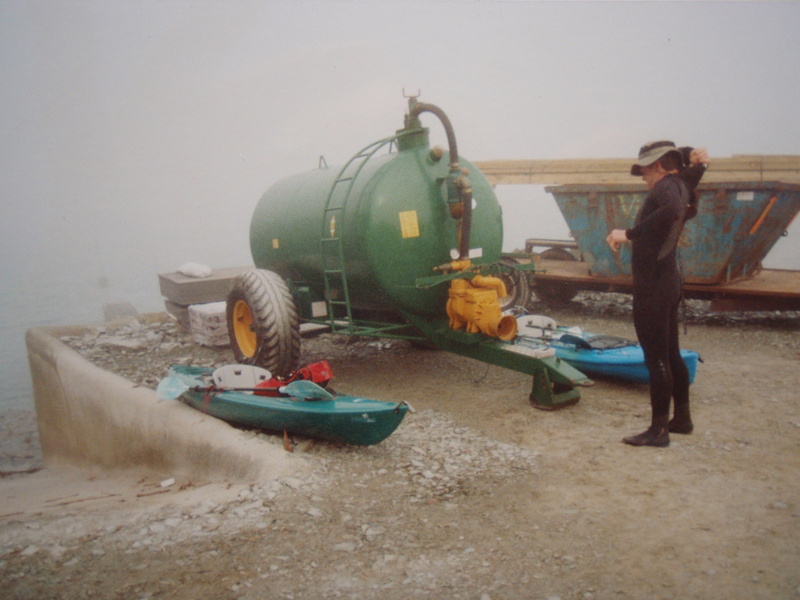 So much for the beauty of Lundy-we hauled out on the quay and left our kayaks between a rubbish skip and a slurry tanker in a patch of oil. Time for some breakfast-a bowl of muesli (I was in charge of that as well).Still in our paddling gear we slapped our way up the long track towards the village and,Hey presto, the fog suddenly cleared and Lundy suddenly looked amazing. Outside the Marisco tavern we managed to track down our old friend Roger Fursdon who now lives on the island and who we hadn’t seen for about fifteen years. Despite this,and the fact that he had no idea we were coming,and the fact that the few other island visitors were well-to-do neatly trimmed National Trust types and we were in wetsuits and a bit smelly, he seemed not in the least bit surprised,or horrified, to see us. We had a bit of a chat and a laugh and relished a chicken-flavoured Pot Noodle complete with Soy sauce sachet. My sandwiches would have to wait. The visiblity had improved enough to see the North Devon coast so we were in for a top trip back.Well,we would have been had I not made one potentially serious error-I tried to tell the time (using my watch). We had been smuggly impressed with our time to get out to Lundy-over 13 miles in 3 hours 45 minutes. I thought we left for the return paddle at 11 o’clock-lots of time to do a spot of fishing AND avoid the Hartland Point tide race.Wrong. We managed to catch one small Pollack on the way back so it qualified as a fishing trip! We sauntered back soaking up the sun,stopping every hour or so to ease knotty muscles. Quirkily my phone rang when we were at least six miles from Terra Firma (except straight down) and it was Henry (my eldest son) wanting to be picked up from golf! I had cunningly planned to get past the legendary tide race of Hartland point before the tide turned or we would be fast tracked to somewhere we didn’t want to go,like Porthcawl. Oops, this is when I realised I hadn’t adjusted my watch to summer time and the swirling water heralded the start of the incoming tide…..and we still had two or three miles to go. We paddled flat out for 45 minutes (not great after 25 miles already) and were still losing ground. We just managed to claw in against the rocks to the north of the point and sneak round close to the shore, before enjoying the last few miles along the dramatic saw-toothed coast in the evening sunshine. As usual the worst part of the trip was carrying the kayaks back to the cars and as usual I twanged virtually every sinew,tendon and ligament in my twiggy legs after I leapt out of the kayak and carried it up the steep track. 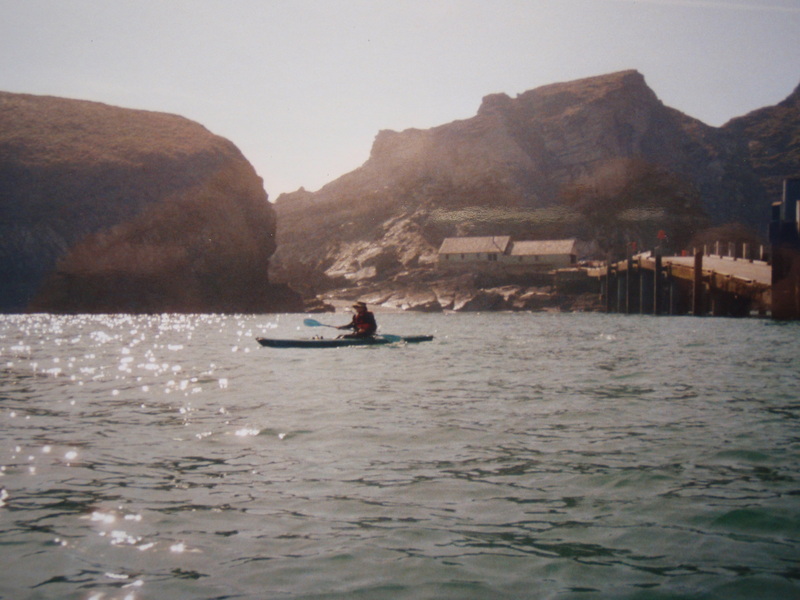 We are fairly sure this was the first crossing to Lundy in Sit-on-top kayaks.I was paddling a Scupper Pro and Austen was using his Perception Freedom.Certainly the first there-and-back-in-a-day-trip for a Pot Noodle. 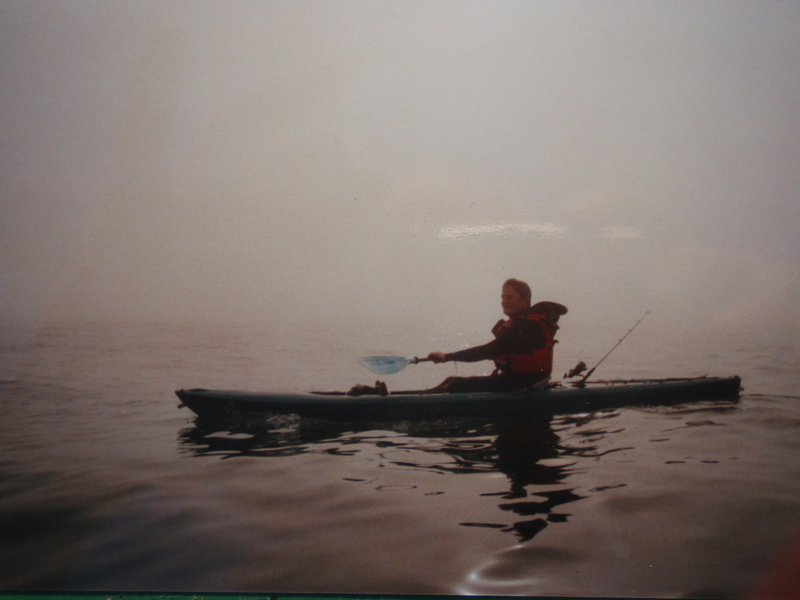 We covered a total of 30 miles and spent about 9 and a quarter hours on the water…..and we never had my sandwiches! 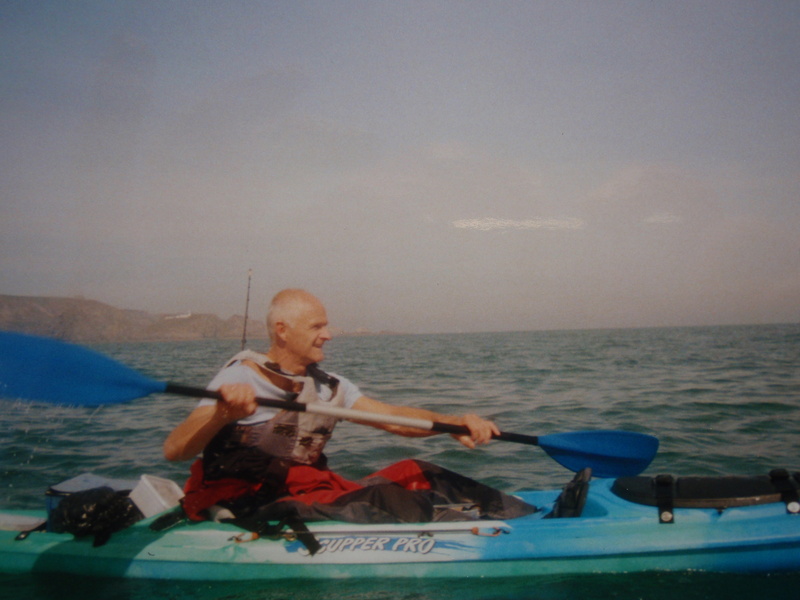 Glad to hear you are as nutty as me about sit-on-top kayaking. Lundy is very ‘do-able’ BUT you’ve really got to go on a day with no wind and no swell. This really isn’t easy as those sort of conditions don’t occur very often (and they NEVER coincide with a day off!). OK you could go with a bit of a swell but it would make the trip more hairy especially if you venture near Hartland point tide race. Remember that SOT kayaks go a lot slower than conventional sea kayaks and catch a LOT more wind. Committing yourself to paddling 15 miles into a headwind is probably potty. Ideally you would choose a neap tide day so there is less of a worry about being sucked by the tide somewhere you don’t want to be, and the neapiest tides occur with high tide around midday round here so thats quite handy. You would have to be laden with safety equipment including VHF radio and flares. 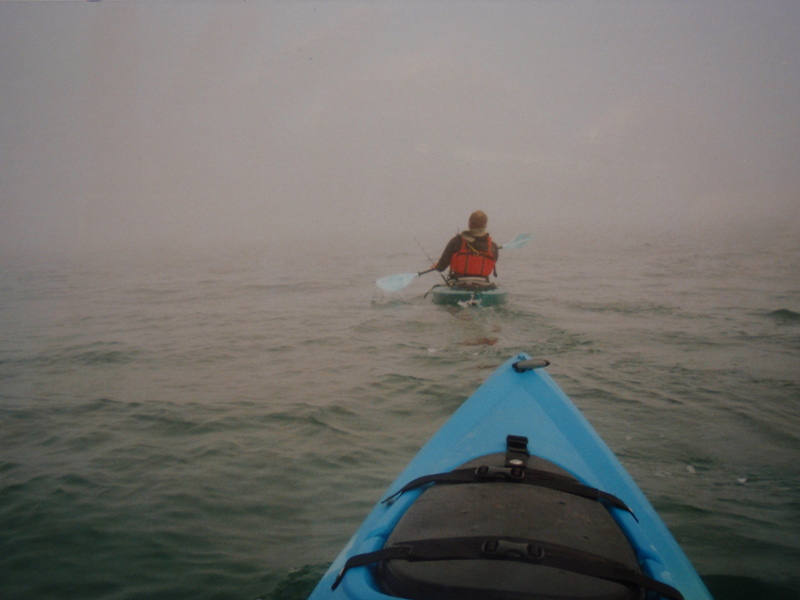 I went with a friend who does a lot of sailing and he navigated us through a thick fog on the approach to Lundy. You’re better off just to choose a decent day-don’t be lured into going on a rubbish day as I tend to be- I get so excited I can’t back out and have nearly got into trouble on several occasions. The fact is that if you have a flat calm day you can manage this no problem. Just paddle nice and steady. It’s much better to keep up a slow rate that you can maintain for hours rather than paddle too fast and having to keep resting. You will find that you can plod along at 3mph no problem, but maintaining 3.5mph requires a lot more effort so there’s just no point. In summary it’s choosing the right day that is the key.